Stop the Bleeding USVI is on a mission to spread their positive messages and bring about significant change in the Caribbean and the Caribbean Diaspora. Changing the lives of the youth to the better, and bringing this spreading wave of violence and crime to a halt, begins with us educating the children in the ways of keeping the Peace. This is what Stop the Bleeding USVI is all about. 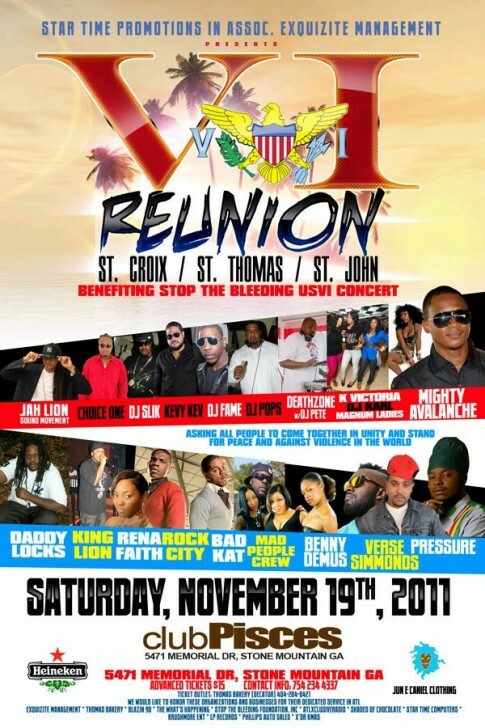 The Annual US Virgin Islands Reunion event in Atlanta, GA will be held this Saturday, November 19th at Club Pisces featuring a concert by many popular USVI artistes for the benefit of Stop the Bleeding USVI. Many of those artistes such as Pressure, Verse Simmonds and Rena Faith are part of the LIATI project (Love Is All There IS) and have recorded the song “Believe” for Stop the Bleeding USVI. The event is the 5th reunion, hosted and produced by Levi MacSheen of Star Time Promotions and Mercedes Peguero of Exquizite Management. Stop the Bleeding USVI benefits from this event as 30% of ticket proceeds which will be given to the foundation to continue their work of uplifting communities through positive messages, activities, conflict resolution training and much more. It also allows for the great opportunity to continue spreading their message of Peace and Love to Virgin Islanders and everyone else in the greater Atlanta area. Mrs. Cheryl Francis, founder of Stop the Bleeding USVI and the LIATI Crew, will be in attendance at the event, and there will be an opportunity for attendees to meet and greet the artistes in attendance. “Believe” CDs will also be available for purchase which the public will be able to get autographed by their favorite artiste.